My “overnight success” took 18 years. I wrote my first novel at age 23, after a dose of reality in the brokerage business. This was the early ’80s, when executive-level women were virtually nonexistent in the world of finance. My first novel, largely autobiographical, as most first novels are, featured my heroine who made it to the top of a brokerage firm. It was continually rejected on the grounds that I had an axe to grind­ and of course I did. After three more novels, which I consider practice at honing my craft, I wrote my first historical, The Jewels of Warwick, centered around Henry VIII and two fictional heroines. I have a strong spiritual connection with late medieval England, which is the basis for my enchantment with this place and time. Jewels took 2 years to research and write, with no internet. It came very close to publication with several romance houses, but missed the mark for containing too little romance. When I finished Jewels, I scoured the history books for another legendary figure to write about. While I browsed the Cambridge Library stacks, a book snagged my eye. Lying, not standing, on the wrong shelf was Crown of Roses by Valerie Anand. It drew me like a magnet. Richard III is a central character in the story, and the author thanks the Richard III Society for helping her. Already hooked on Richard, his tragic death at 32 and his reputation as a usurper and a murderer of his little nephews, I joined this Richard III Society. As everyone else who has a story about how they “met” Richard, he fascinated me. I’d found the subject of my next novel! And it tied in perfectly as a prequel to The Jewels of Warwick. Titled Thy Name is Love, it made the same rounds of publishers, remaining homeless after several rewrites and seven years. In 1999 with the Internet making my life so much easier, I queried the many E-publishers that had recently set up shop, and British publisher Domhan Books responded in March with an offer for my two historicals. Fortunately, Domhan also published print books. I then wrote a time travel, One Too Many Times, and a family saga set in New York City. I switched gears with the urban fantasy Fakin’ It, which won a Romantic Times Top Picks award, with a 4 1/2 star review. I joined a local critique group and my work improved immensely with the critiques I received. My critiquing experience led the way to editing positions and publishing contracts with Eternal Press and Moongypsy Press. In 2009, I answered an ad in the Romance Writers of America magazine and signed with my agent, Jewelann Cone. My recent novels are currently being considered by the ‘big houses’ including St. Martin’s Press and Simon & Schuster. Critiquing and editing gave me the ability to read my work as an editor, to tighten and polish, to add more emotion, to show instead of tell, and the opportunity to critique other authors’ work also made me a better writer. Even though your first, second, third, or even fourth novel may never see print, not a word is wasted if it’s considered a learning experience. I also believe that you must write from the heart, and your passion will shine through in your work. I know there are many roads to success, but patience is the best way! Abraham Lincoln has fascinated me since I was eight years old. I don’t know what got me started, but it might’ve been a book which I still have, titled The Life of Abraham Lincoln, Volume 1, written in 1895. When I was in 3rd grade, in the mid-60s (which shows how long I’ve been a Lincoln nut), my teacher asked us to bring a book to school from home, for a show & tell. My mother suggested I bring this Lincoln book, which even in 1966 was in bad shape­—yellowed, stiffened strips of Scotch tape barely held the covers to the spine. With the wisdom of an 8-year-old that sadly, all of us outgrow, I demurred, saying, “This old book? She’ll think we’re poor!” My mother corrected me: “No, she’ll think we’re rich. Books like this are rare.” Then she proceeded to tape it up some more. Those 47-year-old Scotch tape fragments adhere to the book’s spine and pages to this day. The teacher, Miss Cohen, was duly impressed. I still treasure that book to this day, and it’s one of many on my “Lincoln shelf” which holds books about our murdered president, his wife Mary, his assassin John Wilkes Booth and his family, the “Mad Booths of Maryland” and the conspirators who faced the gallows or years of hard labor because Booth, their charismatic leader, sucked these poor impressionable souls into his insane plot. 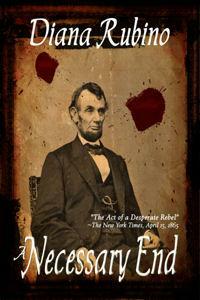 After writing 8 historicals set in England and New York City, I decided to indulge my passion for Lincoln-lore. I began researching in depth about Lincoln’s life, his presidency, his role in the Civil War, and Booth’s plans to first kidnap him, and then to assassinate him. A NECESSARY END combined two genres I’m passionate about­—history and paranormal. I joined The Surratt Society, based in Maryland, and attended their conferences and tours. Through the Surratt Society, I met several Lincoln/Booth/Civil War experts. One lady I’ll never forget meeting is Marjorie “Peg” Page, who by all accounts except definitive DNA testing, is John Wilkes Booth’s great-granddaughter. My trips to Lincoln’s home and tomb in Springfield, Illinois, Gettysburg, Ford’s Theater, and the house he died in, Petersen House, brought me close to Mr. Lincoln’s spirit. Tragically, we’ll never hear Abraham Lincoln’s voice. But his spirit lives on. In my book, which is fiction—but we all know that novels are fictionalized truths—I gave Booth what was coming to him. He got his justice in real life, but in A NECESSARY END, he also got the paranormal twist he deserves. And I enjoyed sticking it to him! By day, Booth was a Confederate spy and courier, taking dangerous missions so that his beloved South could fight the North in the war that tore the nation in two. But in this story, an even darker secret plagues him—he believes he’s the reincarnation of Brutus, the man who slew the tyrant Caesar, and Booth’s destiny in this life is to murder the tyrant who’s ravaged the South­Abraham Lincoln. In obeying the spirit of Brutus, Booth devises a plot to assassinate the tyrant.